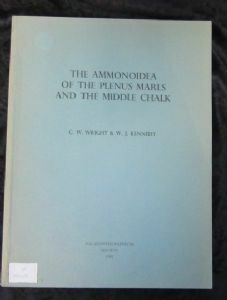 The Ammonoidea of the Plenus Marls and the Middle Chalk. by C.W.Wright and W.J.Kennedy. Palaeontographical Society Monograph 1981. Softback. 148 pages and 32 plates of fossils. Ex University Library copy. In very good condition. 28 x 21.5 x 1.5 cm.